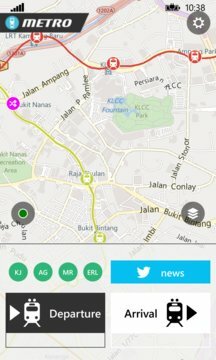 Travel in Great Kuala Lumpur by rail system never been easier with Metro KL Windows Phone. Its interactive and simple UI design, make your journey planer easy then ever. 1. 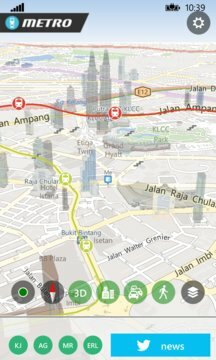 Display routing for all the rails transport in Great Kuala Lumpur area. 2. Display total travelling fares needed. 3. 3D and compass mode for map display. 4. Read out the instruction of your journey. Special thanks to the UI designer : Alexander Wong for his great design.